This Bird is about the Size of, or rather less than, our Red-start; and has a slender black Bill: The Head, Neck, Back, and Wings, are black; except, that Five or Six of the exterior Vanes of the larger Wing-Feathers are partly red. The Breast is red; but divided by a grey Lift; of which Colour is the Belly. The Tail is red, except the End, which is black. The Legs and Feet are black. T he Hens are brown. 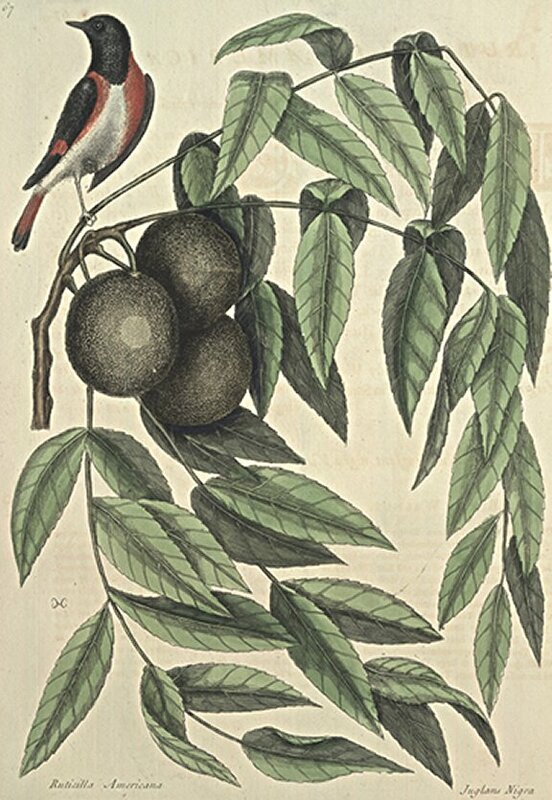 These Birds frequent the shady Woods of Virginia; and are seen only in Summer. Most Parts of the Northern Continent of America abound with these Trees, particularly Virginia and Maryland, towards the Heads of the Rivers, where in low rich Land, they grow in great Plenty, and to a vast Size. The Leaves are much narrower and sharper pointed than those of our Walnut, and not so smooth. The Thickness of the inner Shell requires a Hammer to break it. The outer Shell is very thick and rough on the Outside. The Kernels are very oily and rank tasted; yet, when laid by some Months, are eat by Squirrels, &c. It seems to have taken its Name from the Colour of the Wood, which approaches nearer to Black than any other Wood that affords so large Timber. Wherefore it is esteemed for making Cabinets, Tables, &c.